Every day in customer support is an inbox, a Twitter feed, or a software forum full of new questions. Each is brimming with your customers looking for advice, reassurance, or fixes for their software problems. Each one is an opportunity to take a break from wrestling with your own troublesome tasks and assist someone else in solving theirs. Sometimes the questions are straightforward and can be answered in a few minutes with a short greeting, a link to a help page, or a prewritten bit of text you use regularly: how to print a receipt, reset a password, or even, sadly, close your account. More often, a support email requires you to spend some time unpacking the question, asking for more information, and writing a detailed personal response, tailored to help that particular user on this particular day. Here I offer a few of my own guidelines on how to make today’s email the best support experience for both me and my customer. And even if you don’t consider what you do to be customer support, you might still find the suggestions useful for the next time you need to communicate with a client, to solve a software problem with teammates, or even reach out and ask for help yourself. I’ll be honest: I briefly tried making these recommendations into a clever mnemonic like FAST (facial drooping, arm weakness, speech difficulties, time) or PAD (pressure, antiseptic, dressing). But instead, you get TAHT: tone, ask, help, thank. Ah, well. and thank the customer when the problem is solved. Let’s open an email and get started! With our enthusiasm for emoji, it can be very hard to infer someone’s tone from plain text. How much time have you spent pondering why your friend responded with “Thanks.” instead of “Thanks!”? I mean, why didn’t she :grin: or :wink: too? I’m working against a deadline. Need this fixed ASAP!!!! This hasn’t worked in a week and I am getting really frustrated. I’ve done this ten times before and it’s always worked. I must be missing something simple. They want us to understand the urgency of this from their point of view, just as much as we want to help them in a timely manner. How this information is conveyed gives us an instant sense of whether they are frustrated, angry, or confused—and, just as importantly, how frustrated-angry-confused they are. The content is largely the same, but the tone is markedly different. The first version is a serious, staid reaction to the problem the customer is having; the second version is more relaxed, but no less sincere. Matching the tone to the sender’s is an important first step. Overusing exclamation points or dropping in too-casual language may further upset someone who is already having a crummy time with your product. But to a cheerful user, a formal reply or an impersonal form response can be off-putting, and damage a good relationship. When in doubt, I err on the side of being too formal, rather than sending a reply that may be read as flip or insincere. But whichever you choose, matching your correspondent’s tone will make for a more comfortable conversation. I tried everything in the troubleshooting page but I can’t get it to work again. I am on a Mac. Please help. Hmm, not much information here. Now, if I got this short email after helping five other people with the same problem on Mac OS X, I would be sorely tempted to send this customer that common solution in my first reply. I’ve found it’s important to resist the urge to assume this sixth person needs the same answer as the other five, though: there isn’t enough to connect this email to the ones that came before hers. I’m sorry that you ran into trouble with this! I’ll need a little more information to see what’s happening here. Those questions are customized for the customer’s issue as much as possible, and can be fairly wide-ranging. They may include asking for log files, getting some screenshots, or simply checking the browser and operating system version she’s using. I’ll ask anything that might make a connection to the previous cases I’ve answered—or, just as importantly, confirm that there isn’t a connection. What’s more, a few well-placed questions may save us both from pursuing the wrong path and building additional frustration. I tried everything in the troubleshooting but I can’t get it to work again. I am on a Mac. I’m working against a deadline. Need this fixed ASAP!!!! In the best case, the suggestion works and the customer is on her way. If it doesn’t solve the problem, you will get more information in answer to your questions and can explore other options. And you’ve given the customer an opportunity to be involved in fixing the issue, and some new tools which might come in handy again in the future. The support software I use counts how many emails the customer and I have exchanged, and reports it in a summary line in my inbox. It’s an easy, passive reminder of how long the customer and I have been working together on a problem, especially first thing in the morning when I’m reacquainting myself with my open support cases. Three is the smallest number I’ll see there: the customer sends the initial question (1 email); I reply with an answer (2 emails); the customer confirms the problem is solved (3 emails). But the most complicated, stickiest tickets climb into double-digit replies, and anything that stretches beyond a dozen is worthy of a cheer in Slack when we finally get to the root of the problem and get it fixed. While an extra round of questions and answers will nudge that number higher, it gives me the chance to feel out the technical comfort level of the person I’m helping. If I ask the customer to send some screenshots or log files and he isn’t sure how to do that, I will use that information to adjust my instructions on next steps. I may still ask him to try running a traceroute on his computer, but I’ll break down the steps into a concise, numbered list, and attach screenshots of each step to illustrate it. Do you have a network firewall or do you use any antivirus software? One of those might be blocking a connection that the software needs to work properly; here’s a list of the required connections [link]. If you have an IT department in-house, they should be able to help confirm that none of those are being blocked. This error message means you don’t have permission to install the software on your own computer. Is there a systems administrator in the office that may be able to help with this? For email-based support cases, I’ll even offer to add someone from their IT department to the thread, so we can discuss the problem together rather than have the customer relay questions and answers back and forth. Similarly, there are occasionally times when my way of describing things doesn’t fit how the customer understands them. Rather than bang our heads against our keyboards, I will ask one of my support colleagues to join the conversation from our side, and see if he can explain things more clearly than I’ve been able to do. And then, o frabjous day, you get your reward: the reply which says the problem has been solved. That worked!! Thank you so much for saving my day! I wish I could send you some cookies! If you were here, I would give you my tickets to Star Wars. Then mark that support case closed, and move on to the next question. Because even with the most thoughtfully designed software product, there will always be customers with questions for your capable support team to answer. So there you have it: TAHT. Pay attention to tone; ask questions; bring in help; thank your customer. You and your teammates are applying a variation of this golden rule in every email you write. You’re the software ambassadors to your customers and clients. You get the brunt of the problems and complaints, but you also get to help fix them. You write the apologies, but you also have the chance to make each person’s experience with your company or product a little bit better for next time. I hope that your holidays are merry and bright, and may all your support inboxes be light. Elizabeth Galle got her start in customer support behind the counter of her grandfather’s delicatessen. She’s since moved from sandwiches to software, but the principles are about the same. 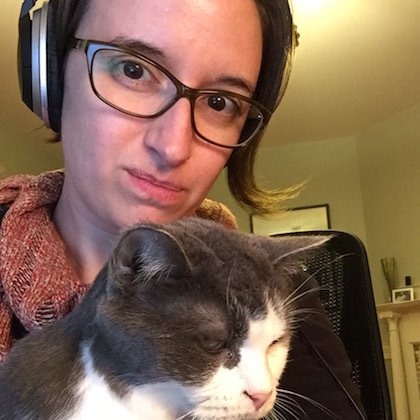 Liz talks about her cat & quotes West Wing episodes as @drinkerthinker, and supports Adobe Typekit with the team at @typekit.